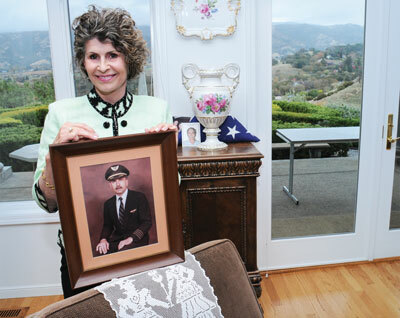 Heidi Campini holds a portrait of her husband, Jim Lawrenz. Jim Lawrenz and Heidi Campini, a husband-wife team of life-long adventure-seekers and philanthropists, shared a common conviction: Do whatever you can to help support your local community. They spent decades fulfilling that principle. Unfortunately, Jim lost a hard-fought battle with melanoma in 2013, but Heidi has remained determined to carry on with their legacy of leadership and support. Before Jim passed, the couple decided to direct their net worth and entire remainder trust—in the form of highly appreciated assets —to NorthBay Healthcare Foundation to support the NorthBay Cancer Center, according to Brett Johnson, president of NorthBay Healthcare Foundation. The two were introduced by mutual friends at a party in the early 1980s. “We began a long, slow and sweet friendship,” Heidi recalls. Jim proposed in 1983 and they were married in Hawaii in 1984. But, even before they met, each had logged many miles and experiences traveling the world. Heidi, with her dual Swiss and American citizenships, grew up in Vacaville but spent some of her teen years living in Switzerland attending high school. She returned to graduate from Vacaville High School and UC Davis. By the time she was in her 20s, she had already traveled throughout Europe, Egypt and India, where she helped build a rural hospital. Once she and Jim were married, they helped fund its sustainability and growth over the years. It has since begun a nursing school on site. In more recent years, she would trek more than 500 miles on the historic Camino de Santiago across northern Spain to raise funds for the North-Bay Center for Women’s Health. We realized we might be able to inspire others to give any way they could, if we shared our story. Although Jim grew up in Tomah, Wisconsin, and graduated from UW-Milwaukee, he landed—literally—in Fairfield in the 1970s, brought here through his service in the U.S. Air Force. He was a pilot and aircraft commander both in Vietnam and the Desert Storm Gulf War, flying C-130s and the C-5 Galaxy. Jim was awarded the Air Medal, the Air Force Commendation Medal and numerous USAF decorations, commendations and citations. He retired as a lieutenant colonel. He began flying commercially during his last years with the Air Force Reserves, serving as a commercial airline pilot and captain. Jim served as a trustee and president of the Vacaville Museum Board, and generously supported several other local charitable causes. He joined the NorthBay Healthcare Foundation board of directors in 2003, was named secretary in 2005 and chairman of the board in 2011. Under his leadership the Foundation experienced significant growth and undertook several successful fundraising campaigns, including the creation of Open That Bottle Night, to support NorthBay Hospice & Bereavement. In 2009, Jim was diagnosed with throat cancer, but recovered. Melanoma surfaced in 2012, and the disease progressed quickly. He received consultations in the Bay Area, but opted to come under the care of the physicians at NorthBay Cancer Center. “He was treated magnificently by the best, most professional physicians and medical staff at the world-class center,” Heidi said. He shared his care experience with a crowd of cancer survivors at the 2013 Cancer Survivors Day event. “Three of the most promising and busiest physicians (at NorthBay) spent hours with me and even worked through their lunch. That’s compassionate care, close to home, and thank God we have them in our community,” he said. Unfortunately, Jim lost his battle with melanoma just a month later. “Jim was a great leader and he chose to lead by example. With this gift, he has also left a legacy for generations,” Brett noted. “Jim would have been delighted to see this new, state-of-the-art Cancer Center open here in Vacaville, in a place where patients will be treated like kings and queens,” Heidi added. Your estate planner can easily set up a charitable remainder trust or a charitable gift annuity, according to Brett Johnson, president of NorthBay Healthcare Foundation. A charitable remainder trust is an arrangement in which property or money is donated to a charity, but the donor continues to use the property and/or receive income from it while living. The beneficiaries receive the income and the charity receives the principal after a specified period of time. The donor avoids any capital gains tax on the donated assets, and also gets an income tax deduction for the fair market value of the remainder interests that the trust has earned. In addition, the asset is removed from the estate, reducing subsequent estate taxes. “These financial tools are especially useful if you have highly appreciated assets, such as stocks or real estate,” noted Brett. “By setting up such a trust, you get the best of both worlds: you avoid capital gains taxes on your assets, and receive a tax deduction and a tax reduction. Most people don’t think of it this way, but you’re going to be ‘philanthropic’ when your estate settles, either in the form of payment of higher taxes to the government, or through a donation to a favorite cause.” For information, call (707) 646-3131.